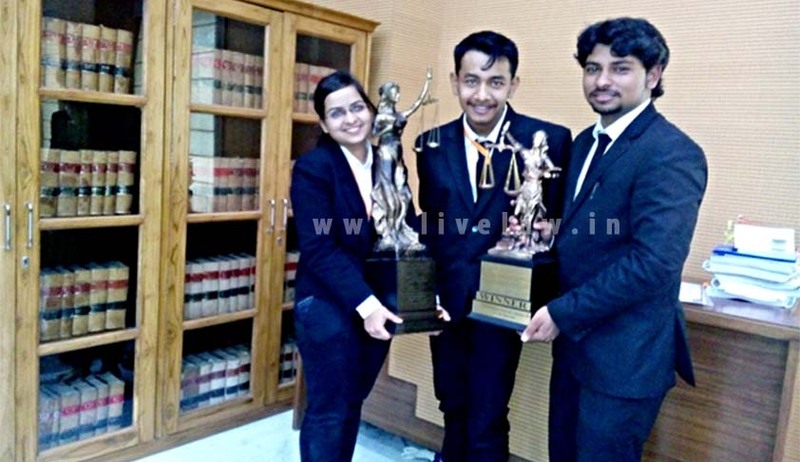 Symbiosis Law School, Pune emerged as the winners in the recently held 4th RGNUL National Moot Court Competition 2015 defeating NUSRL, Ranchi. The team consisted of Chandrajeet Das and Priyanka Arora (both 3rd year) as speakers whereas Ridhish Rajvanshi(II year) as researcher. Through this interview, Live Law makes an attempt to unravel the winning strategies and mooting plans that sets a winner apart from the rest. LiveLaw: Your performance in this moot court competition was undoubtedly the best. Here comes the conventional question- How does it feel? Chandrajeet : It feels great undoubtedly, and the feeling can’t be put down in words. It is the first championship win for our college in the national sector for this mooting season, so it is all the more overwhelming. Prior to this, our college had only “Runners up” to our credit for this season. LiveLaw: So what do you think any team would need to nail this moot? Chandrajeet : Firstly, like every other moot, the team has to be thorough with every aspect of the facts and the law associated with it. One has to interlink both and come up with legitimate grounds to support the petition from either side. Often, a single word or a single phrase in the problem gave rise to an entire ground to support an argument; and these facts are not usually evident prima facie. So to reiterate, one has to read the problem multiple times, like nothing less than 20-25 times. Also, while pleading, confidence is the key factor. Judges will always try to confuse you and throw you off track, but you have to come back to the mainstream after tackling their questions, to which confidence becomes indispensible. LiveLaw: On what area of law was the focus of the problem? Chandrajeet : It was purely Constitutional law involving Reservation of Bills by the Governor for the President’s assent under Art. 200, removal of Governor under Art.156, imposition of State emergency under Art.356 and other ancillary matters such as validity of directions issued by Central government, Federalism etc. LiveLaw: The questions of law in a moot problem are the quality determining yardstick for any moot court competition. How would you judge yours? Kindly provide details. Chandrajeet : Our problem involved multiple challenging aspects of Constitutional law. The problem could be divided into three major areas of law- firstly, Governor’s discretionary power to reserve Bills and power of the President to issue directions in that regard, secondly, removal of Governor at the pleasure of the President, and third, imposition of State emergency under Art.356. As for the first area, it was clearly tilted in favour of one side and it was quite a herculean task establishing a fit case for the other side. It required proper analysis of the issue backed by meticulous research so as to come up with an alternative mechanism to counter the strong side on individual grounds. The other two areas had established law to support both sides. But it kept room for introducing innovative arguments too and that was exactly what we did. So essentially, the problem was of a multi-faceted nature with a lot of scope for innovation and alternative interpretation. LiveLaw: How do you think the integrities of a moot are helpful for students of law, of course other than the quasi-real perspective it gives you about the procedure? Chandrajeet : Moots build your analytical skills to a great extent. It develops your confidence, which is specially required if you’re keen on pursuing litigation as a career. It also helps you to be articulate in your research. Moots are the best way to implement and understand the law, from an out-of-textbook perspective. LiveLaw: It seems that the competition was fierce. How was your overall experience? Chandrajeet : There were a total of 50 participating teams so competition was indeed fierce. Qualifying for the quarter-finals was the toughest and trickiest bit as only the top 8 teams out of these 50 teams would qualify, based on cumulative speaker scores and memorial marks. Hence in both Prelim rounds, we had to ensure that our pleadings were not just good but exceptional. Thereafter in the subsequent rounds, qualification was subject only to total Speaker scores, and we had to ensure that both our arguments as well as our manner of presentation was better and more convincing than the other team. Our best competition was in the semis when we were up against NUALS, Kochi. Also, every round leading upto the finals served as a practice round, making us better equipped to deal with judges’ questions, and finding loopholes in the opponent’s arguments as well as covering up our own flaws. LiveLaw: Court etiquettes, the manner in which the judges and the issues are addressed and your pattern- all matters a lot. What in the speech of your team’s oralists you think was different to cling on the judge’s mind? Chandrajeet : One might not always have the support of law to back an argument; then again certain questions are asked by the judges out of the proposition, to answer which you have to necessarily deal with the intricacies of the facts. Apart from our sound backing of law, I think it is the analogies drawn by us from the facts to make our arguments complete and convincing, that really clicked and gave us an extra edge over the others. LiveLaw: How was your experience at the finals? Chandrajeet : We faced the toughest and the best panel of judges in the finals. It was a 5-judge bench comprising of sitting Justices of the Punjab and Haryana High Court, as well as other eminent legal personalities such as the ex-Director of the National Judicial Academy, Bhopal and the VC of RGNUL. We were tested on every point of law and facts; not a single argument being accepted devoid of any counter questions. In the end, it was a unanimous decision of the Bench. LiveLaw: Did you have some kind of strategists or mentor guiding your preparation in the moot or some guidance from seniors who had been to the same moot before? What is the policy of your university’s moot society when it comes to preparing newbies for mooting? Chandrajeet : All of us had mooted prior to this and we weren’t new to the circuit. But nonetheless, pursuant to our mooting policy, we were also assigned an official strategist like every other team, to aid us in the preparation of this moot. Our official strategist, who was in his 5th year, helped us in multiple ways, right from structuring our arguments to taking our pleadings. Apart from this, there were other seniors too who helped us to a great extent, starting from drafting to taking pleadings and even when it came to providing motivation. There were even seniors who had graduated and were pursuing their higher studies, who took time off from their busy schedules to take our pleadings over Skype. LiveLaw: What was your team plan when it comes to preparing for the competition? LiveLaw: How was the judging in the preliminary and the final rounds? How well did it satisfy the oralist’s hunger for appropriate and substantial questions, on which the team had been working for long? Chandrajeet : Every round including the finals, were unique in their own ways. The judges always round had constructive feedback for our performance, which was really very helpful. The judging for every round was brilliant. We were thoroughly tested on all points of law. Many new aspects of the problem came to light during each of the rounds on which we worked and tried to address in our subsequent rounds. It all ultimately added up to the finals for which we were best prepared. LiveLaw: A lot depends on the memorial when it comes to speaking. How well do you think this statement is justified in case your team’s perspective? Chandrajeet : Our memorials were praised by multiple judges due to the articulate manner in which we had framed our arguments, and also due to the formatting. If the memorial is well structured, it definitely gives you a basic flow in which you need to proceed while arguing. However, to convince the judge, one has to structure arguments out of the memorials and explain every intricacy of it. The memorial is merely a summary of the arguments. Then again ideally, one should be so well versed with the flow that he or she need not even refer to the memorial. In such a case, the memorial does not serve much purpose except for referring to the authorities cited. It was the same with our team. LiveLaw : Some advice that you would give to the budding mooters? Chandrajeet : Hard work is the key to success. Hard work means working sincerely and meticulously. It would mean if you are citing a judgement, taking the efforts of reading at least the crux of the judgment, before relying upon it, and not just because it has been mentioned in the commentary. It is that willingness to go the extra mile that sets you apart from the others. Before you go forth to do a moot, you have to ask yourself what your expectations are. If the answer is winning it, there should be no turning back from that point and you should do every single thing that is necessary to achieve that end. It is only when you want to win it as badly as you want to breathe air that you will get what you want.